He’s got the look … JT’s Lobodacious 1358-D, owned by Terry Schmidt, is heterozygous for the Curly Jim gene, SP6. Dr. Mitch Wilkinson unravels the DNA behind the Curly Jim line of domestic curly horses found in the United States. It is, he says, a mysterious tale of two transcription factor mutations. Wilkinson, a lifelong horse enthusiast with a post-doctoral master’s degree from Baylor University in biology, as well as dental and chemistry degrees, is chairman of the Curly Mustang Association and is vice-chairman of the Research Department of the International Curly Horse Organization (ICHO). In 1956, two young, curly-coated stallions were bought by a man from Mountain View, Missouri, named Vic Clemens. Clemens bought the horses at an auction in Tennessee and had them shipped by train to Mountain View. The horses resembled Missouri Fox Trotter horses in build; they also were gaited. The chestnut-colored stallion had several owners throughout his life. Two curly horses arrive by train to Mountain View, Missouri. Curly Jim was pasture-bred to many mares. Recent genetic tests have confirmed that a line of curly-coated ponies known as the McKay ponies owe their curly coats to Curly Jim. Gentleman Jim, left, and Kopper Kid. Besides founding a line of curly-coated ponies, Curly Jim was responsible for a line of riding horses. Curly Jim’s line of gaited curly-coated saddlehorses became one of the most popular lines of curly-coated horses. In the 1950s and 1960s, Missouri Fox Trotter horses were bred intensively in the region where Curly Jim resided. Since Curly Jim was gaited and had similar conformation to Missouri Fox Trotters, it was only natural that his line became mixed with Missouri Fox Trotters. Due to extensive breeding with Missouri Fox Trotters, the Curly Jim line will forever be associated with the Missouri Fox Trotter breed. The connection of the Curly Jim line to the Fox Trotter breed occurred through his daughter Blaze. Curly Jim was bred to a grade mare known as the Bradford Mare. The resulting foal was Blaze. Blaze inherited the curly gene from her father and was curly coated. Blaze was subsequently bred to Walker’s Merry Lad, a renowned, straight-haired Missouri Fox Trotter stallion who was standing at stud in the Mountain View, Missouri, area at that time. The breeding resulted in a gaited, curly-coated stallion named Walker’s Prince T.
Walker’s Prince T was a curly stallion that was used extensively and bred not only to other curly horses but also to many Missouri Fox Trotter mares. Eventually, there were three stallions who carried the Walker’s Prince T name. These stallions not only passed on the unique curly coat of Curly Jim, but also the gait mutation from the Missouri Fox Trotter mares that were bred into the line. The Pedigree of Walker’s Prince T.
The original Walker’s Prince T was owned by Lester Tunes. Johnny Brooks owned Walker’s Prince T (II). The combination of gait and the unique curly coat which will not shed mane and tail hair during the summer months makes the Curly Jim line of curly horses extremely popular. Interestingly, both traits are due to mutations within genes that produce transcription factors. In order to understand the mechanisms involved in producing these two traits, gait and coat curl, we need to investigate what transcription factors are and how they affect organisms. All the information needed for any living thing to live, grow, and reproduce is stored in its DNA. A fundamental question is how and when the information coded within the DNA molecule is utilized by the organism. Basically, the information coded on the DNA molecule is transferred to a messenger RNA molecule (mRNA) which in turn transfers the information to transfer RNA (tRNA) molecules. The transfer RNA molecules work within a cell organelle called a ribosome which produces proteins. Within the ribosome, tRNA acts as an adaptor to convert DNA information to proteins by recognizing the mRNA codon (three base RNA code) at one end and binding to a single, specific amino acid at the other end. Transfer RNA molecules assure the proper order and kinds of amino acids which when bound together in long chains will become proteins. All the physical characteristics of an organism (known as the phenotype) are made up of thousands of proteins. There are also water, minerals, and fats, but all the living functions and the basic framework of all living things are made of proteins. Transcription factors help to regulate the timing of the information that is being transcribed from the DNA molecule to the mRNA molecule. Transcription factors are themselves proteins that are produced by genes (discrete segments of DNA at specific locations called loci). In order for any organism to live, essential proteins must be produced in the correct amounts, in the proper sequence, and at the correct time. This complex interaction of one group of essential proteins regulating another group of essential proteins is where transcription factors take a critical role. Transcription factors control the rate of transcription of genetic material from DNA to mRNA. Without regulation the vital processes of the cells would be random chemical reactions which would produce uncontrolled amounts of proteins that would be incompatible with life processes. Transcription factors bind to the DNA molecule to regulate the rate of transcription, but they do not regulate transcription by themselves. Other proteins like coactivators (speed up transcription) and corepressors (slow down transcription) work with transcription factors to help regulate transcription. This complex relationship is especially important during fetal development when the timing and amounts of proteins help form the developing animal. In August of 2012, the prestigious science journal, Nature, published an article by an international equine genomics group which included Dr. Leif Andersson from Uppsala University in Sweden and Dr. Gus Cothran from Texas A&M University in the US. This article showed that in part, gait in horses is due to a nonsense mutation in a gene known as DMRT3 which is located on the equine 23rd chromosome. The DMRT family of transcription factor proteins made from the DMRT3 gene have a unique and distinct binding mechanism for DNA to help regulate the timing of information transferred to mRNA. Misspellings happen on a regular basis as DNA replicates. On average, a misspelling occurs in one out of every 300 base pairs. This is one mechanism that allows mutations to occur in nature. Most of the time, the misspellings occur in areas of the DNA that are not being used, but every so often, the misspelling occurs in an area of the DNA chain that codes for a protein. This area of the DNA chain is known as a gene. In this case, the normal base cytosine or C was substituted with an adenine or A. This produced a triplet code that was by chance a codon for the mRNA to stop reading the DNA molecule. This is known as a stop codon. When the mRNA encounters a nonsense mutation, an unreadable triplet base code, or in this case, a code to stop reading the DNA chain prematurely, it stops transcription of the DNA chain which results in a defective and truncated protein. 23rd equine chromosome with A substituted for a C resulting in a premature Stop Codon. This discovery of the mutation within the DMRT3 gene is the first step in understanding gait in horses. There is a large variety of gaits in equines. Other mutations which are thought to combine with the DMRT3 mutation to produce the different gaits are yet to be found. Around 140 curly coated horses have been tested for gait. Most have been from the Curly Jim line. Horses that have tested AA and have received the mutation from both parents show gaited characteristics. Horses that test AC or have only one copy of the DMRT3 mutation can have a softer ride, but that trait is inconsistent. These horses generally do not gait in tested curly horses. Earlene “Bunny” Reveglia has made a very useful chart describing the DMRT3 gene’s influence on gait in horses. DMRT3 Gait Chart- Diagonal Gaits- the diagonal 2 beat trot on the left (2 diagonal hooves hit the ground at same time) and the DMRT3 mutation soft uneven gait 4 beat diagonal Foxtrot top left (each hoof hits independent of the other diagonally). Square Gaits- Center is the 4-beat square gait walk (each hoof hits the ground independently with equal spaced timing). Center top is the DMRT3 mutation soft 4 beat gait the Running Walk and Rack; they are also square gaits. (Each hoof hits the ground at separate evenly spaced internals). It is important to note that “gait” in the Curly Jim line is entirely independent from curly coat producing genes. Gait and curl are different inheritances on different chromosomes. In 2016, a scientific study was published about the origin of gaited horses. The paper concluded that the DMRT3 mutation occurred with the birth of a single horse that lived somewhere between 850 AD and 900 AD in England. One of that horse’s parents had a misspelling of the DMRT3 gene during the division of the cells that would become sperm or egg cells for reproduction. Having a gait would probably not be an advantage in nature; that is why gaited horses are very rare in the wild horse populations around the world. The Curly Jim line, like all gaited horses, has a direct link with a unique horse born long ago in medieval England. The DMRT3 gene mutation originated in medieval England. In the future, the complete genetic picture of gait in equines will be known, but for now, the mutation in the DMRT3 gene on the 23rd equine chromosome is the first step in our understanding of all forms of gait. In November 2017, the scientific journal, Genetics Selection Evolution published the results of a scientific study that was conducted four years before publication. Dr. Laurent Schibler and his team in France at the University of Paris in coordination with Dr. Gus Cothran at Texas A&M University in the US had isolated the first curly gene. This gene mutation that produced curly coats in horses was a mutation within a keratin gene. The missense mutation found in KRT25 is a mutation of a specific hair producing keratin gene in the 11th equine chromosome which produces a type 1, inner root sheath specific keratin protein that is essential in the assembly of alpha keratin protein complexes required for the proper construction of the hair shaft. Cross section of a hair shaft. When a mutated version of the KRT25 mutation is passed on to the foal by both parents, the foal is said to be homozygous for the mutation. This is shown in the genetic shorthand as AA. The AA combination produces horses with sparse brittle manes and tails. In April 2018, Dr Ottmar Distl and his team in Germany published an extensive study which included not only histological studies of curly horse hair, but also the isolation of a second curly horse gene mutation in a gene which produces a transcription factor protein. It was found that the Curly Jim line’s coat was produced by a mutation in the SP6 gene in which a misspelling of the DNA occurred. This was again a missense mutation where a thymine base, or T, was substituted for a cytosine base, or C. This type of mutation was also a SNP which is the misspelling of a single base in the DNA chain. 11th equine chromosome showing substitution of a thymine (T) for a cytosine (C) in the SP6 gene. Unlike the KRT25 mutation which happened within a keratin producing hair gene, the SP6 gene mutation happened within a transcription factor-producing gene which then produced a slightly altered transcription factor protein. The SP6 gene produces two similar transcription factor proteins, epiprofin and SP6 transcription factor. A gaited horse with a heterozygous SP6 mutation. A gaited horse with a homozygous SP6 mutation. Micro curls or “Brillo Pad” curls are tight, short, and coarse. They make up the body coat in horses with Curly Jim homozygous inheritance. Although KRT25 and SP6 are both curly producing genes on the 11th horse chromosome, they are distinctly separate genes that are inherited separately and independently. They can be inherited simultaneously in the same individual. It was found by Dr Distl’s research group that the effects of KRT25 mutation do affect the characteristics of the SP6 mutation when both are found on the same individual. An example often sited to illustrated epistasis is shown below. In classical genetics, if genes A and B are mutated, and each mutation by itself produces a unique phenotype but the two mutations together in the same individual show the same phenotype as the gene A mutation, then gene A is epistatic and gene B is hypostatic. A classic example of the epistatic effect of one gene over another is found in albinism. The system of genes that determines skin color, hair color, and eye color in humans and animals is independent of the gene responsible for albinism (lack of pigment). The gene for albinism is an epistatic gene, and the genes for brown hair and other color traits are hypostatic to the albinism gene. The individual still inherits the genes for brown hair and blue eyes, but these genes can’t be expressed due to the presence of the gene for albinism. Epistasis: The genes for brown hair and blue eyes are still present but cannot be expressed due to the presence of the gene for albinism. Epistatic genes and hypostatic genes are two separate and independent gene mutations that interact on one aspect of the organism by chance. Epistasis is not dominance. Genetic dominance is an interaction between alleles (two different versions of a gene) at the same gene locus (a specific gene location on a chromosome). Examples: The A allele is dominant over the G allele at the KRT25 locus. Likewise, the T allele is dominant over the C allele at the SP6 locus. So, KRT25 and SP6 are two independent genes at different locations, but the effects of KRT25 mask the effects of SP6 like the gene for albinism masks the effects of a brown hair gene. If we look at a horse that carries one copy of the KRT25 mutation simultaneously with one copy of the SP6 mutation (AGCT), and that horse is crossed with a horse that does not have a copy of either the KRT25 nor the SP6 mutation (GGCC), we can see the odds or possibilities for the foal produced. An actual example is shown below with three horses owned by Angie Gaines in Texas. The cross of a dual gene stallion with a smooth coat mare. Each color represents a different genotype. Dr Distl used the term “hypotrichotic” to describe the scant mane and tail characteristics associated with AA or homozygous horses that inherit the KRT25 mutation. In recent years, we have begun to understand that curly coats in horses can be produced by a variety of different and distinct gene mutations. We have also learned that curly coated horses can be found in many places throughout the world. The coats of these horses have distinct phenotypes or properties. To date, none of the distinct populations have had gene mutations in common. So where did all the curly coated horses originate that we now find in such diverse locations around the world? In the future, we may find that some were imported from different locations and seeded a new population, but we will probably find the majority resulted from simple and random mutations in local populations of horses. Somatic cells produce all non-reproductive tissues in living animals. Mutations in somatic cells are called somatic mutations. Somatic mutations are not passed along to the next generation by sexual reproduction; they die with the animal. Cancer tumors are a unique class of somatic mutations. In contrast, reproductive cells produce mutations which will be passed on to future generations. These mutations are termed germinal mutations. This chart illustrates the difference between somatic and germinal mutations. In the case of Curly Jim, a simple, single DNA base misspelling probably occurred during formation of a reproductive cell which became egg or sperm in a process termed meiosis. These reproductive cells, or gametes, have one-half the number of chromosomes found in somatic cells. Gametes are said to be haploid, meaning one-half of the animal’s genetic material is present. Because there were originally two horses with this curly coat phenotype, the SP6 mutation probably occurred at least two generations before the birth of Curly Jim either in the stallion or mare that were his grandparents. The SNP that resulted in the SP6 mutation did not affect Curly Jim’s grandparents, but was passed as a dominant genetic trait to an offspring that would become one of Curly Jim’s parents. When such things happen, such as two straight-haired parents producing an unexpected curly offspring, it is common to deduce that a recessive gene was involved and that both parents were carrying the recessive gene. That can be true, but not always. In this case, it was not. But if the resulting mutation is dominant, the mutation will increase within the population if it is favorable for survival. In the case of domestic horses like Curly Jim, the selection is due to human favoritism. Much time and energy have been spent wondering where curly horses originated, and some may have come from other locations, but most will be germinal, dominant mutations that happen spontaneously in local horse populations around the world. No distant curly horse populations to date have matched either KRT25 or Sp6. There is at least one other undiscovered curly producing gene mutation in the domestic curly horse population in the US called the Cook gene. 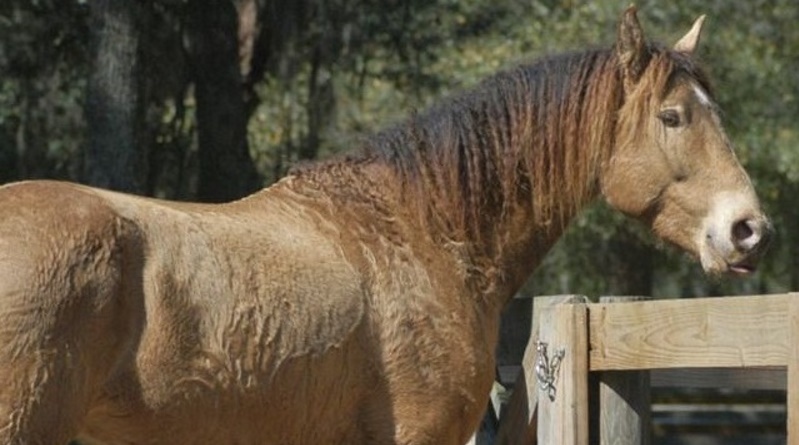 A second curly coat gene mutation has been found in the Sulphur Mustangs. Its outward manifestations are very much like the Curly Jim SP6 mutation. Like the SP6 mutation that has not entered the feral horse population, the Sulphur Mustang mutation has not yet entered the domestic curly horse population. The very popular Curly Jim line of horses owes its popularity to mutations in two transcription factor-producing genes, DMRT3 and SP6. The combination of full and non-shedding curly mane and tail with comfortable gait will continue to make this line of curly horse desirable for many owners. As a group, curly horse enthusiasts should embrace the fact that the curly horses found in the U.S. and Canada may be part of our unique equestrian heritage and that most will surely prove to be horses that were created by nature in North America. Dr Mitch Wilkinson and Lucky. Dr Mitch Wilkinson has been a lifelong horse enthusiast. After receiving a bachelor’s degree in chemistry and professional dental degrees, he earned a post-doctoral master’s degree from Baylor University in biology. Currently, Dr. Wilkinson is chairman of the Curly Mustang Association and vice-chairman of the ICHO Research Department. His articles have been published in the United States, New Zealand/Australia, Russia, and Austria. A special thanks to friends who helped edit and provide helpful suggestions for this article: Dr Karen Zierler, Dr Gus Cothran, Earlene ”Bunny” Reveglia, and Beverly Arrendell. Thomas, Shan. Myth and Mystery: The Curly Horse in America, New York: C.S. Fund Inc.,1989. Scott, DW.”Skin of the Neck, Mane, and Tail of the Curly Horse.” Equine Veterinary Education 2004; 16:201 -6. Bowling, Ann. Horse Genetics. (Cambridge: CABI Publishing, 1996). Bailey, E. and Brooks, S. Horse Genetics – 2nd Edition. (Cambridge: CAB International, 2013). Willett, Edward. Genetics Demystified. (New York: McGraw-Hill, 2006). Reveglia, Earlene. International Curly Horse Organization. 322 Tulie Gate, Tularosa, NM. August 2018. ICHO registry site. Curly Traits: including inheritance and curly hair types. and History of the Curly Horse. curlyhorses.org., https://www.ichocurlyhorses.com. Curly Horse Pedigree Database. www.curlyhorses.info. Reveglia, Earlene, et.al. “History of Curly Jim Line,” ICHO Investigation: yrs. 2000 – 2005. Whiting, D A. “Structural abnormalities of the hair shaft” Journal of the American Academy of DermatologyJan;1691 Pt0:1-25. Lisa Andersson, Martin Larhammar, Fatima Memic,et al. “Mutations in DMRT3 affect Locomotion in Horses and Spinal Circuit Function in Mice” Nature Vol. 488, August 2012, pp. 642-646. Free download. Pierce, Benjamin. Genetics: A Conceptual Approach, 5th Edition. (New York: Macmillan Pub., 2013). Wutke, Saskia; Leif Andersson; et al. “The Origin of Ambling Horses”. Current Biology, 2016; 25(15). Sponenberg, D P. “Dominant Curly Coat in Horses,” Genetics Selection Evolution 22 (1990): 257-60. Promerova, M. et al. “Worldwide Frequency Distribution of the “Gait – Keeper”Mutation in the DMRT3 Gene,”2014, Animal Genetics 45:274-82. Annika Thomer, Maren Gottschalk, Anna Christmann, Fanny Naccache, Klaus Jung, Marion Hewicker-Trautwein, Ottmar Distl & Julia Metzger. “An epistatic effect of KRT25 on SP6 is involved in curly coat in horses,” Scientific Reports, volume 8, Article number: 6374 (2018). Reveglia, Earlene. “Genetic Data Base,” International Curly Horse Organization, 322 Tulie Gate, Tularosa, NM, August 2018. A wonderful explanation of the Curly Jim line of horses! Dr. Mitch Wilkinson, thank you for the time and dedication in researching our wonderful Curly horses and their genes. We were trilled to have Chester, Blossom and Bucky be part of this exciting news. Thanks for explaining this complex but fascinating subject. Still I wonder how the “spirit of the horse” relates to all of this?